Tunis, Tunisia – When Ghofrane Binous was a child, she was told she was dirty because her skin was black. She returned home crying that day and scrubbed her face until it was raw. Later on, she said she started using bleach on her face because she was told it would make her skin lighter. Many Tunisians are “instinctively racist”, Binous said, explaining that racism and discrimination are everyday occurrences for many black Tunisians. In May, Binous made global headlines when a disgruntled passenger on a Tunisair flight called her a racial slur. The passenger never faced action, according to Binous. But that could change now. 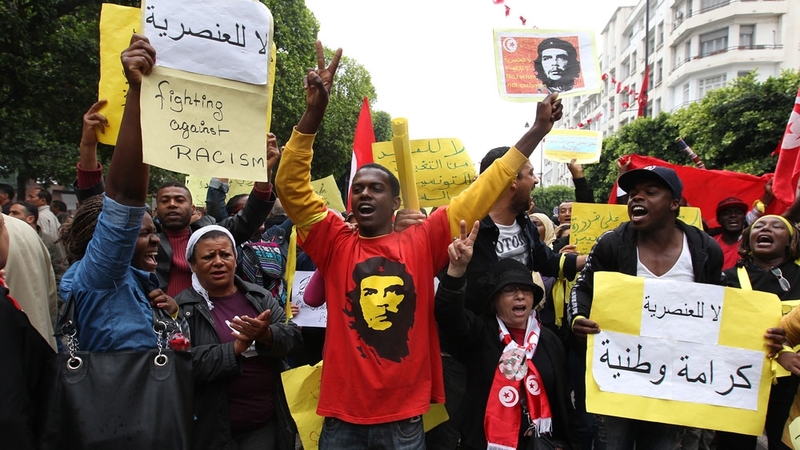 Last Tuesday, Tunisia’s parliament voted to criminalise racial discrimination, in a vote activists hailed as historic in the North African country, where unofficial estimates say 15 percent of the 11.5 million population identify as black. Under the new legislation, those convicted of racist speech face one month in prison and a $350 fine, while incitement to hatred, making racist threats, or belonging to an organisation that propagates racism can result in one to three years in prison and fines ranging from $185 to $1,110. The law makes Tunisia the first Arab country, and the second in Africa, to outlaw racial discrimination. But activists say a lot more is needed to change racist beliefs, which they say remain deeply ingrained in Tunisian society. Tunisia was the first Arab country to abolish slavery in 1846, but black Tunisians remained marginalised socially, economically and politically in the subsequent decades, while racist speech and conduct was passed on from generation to generation. In Tunisia, the words “kahlouch”, a pejorative term for “black, and “woussif”, which translates to “slave-servant”, are widely used to identify a black person. Yet activists say many light-skinned Tunisians do not believe the country has a problem. When campaigners first started organising public protests against racism in 2013, they said only a handful of people turned up. Rania Belhaj Romdhane, an organiser at Mnemty, a prominent minority-rights group, said the public at the time “didn’t understand what we were saying”. According to Mnemty, black people in Tunisia are frequently the target of verbal abuse, and sometimes, physical attacks because of their skin colour. In recent years, such incidents have gained media attention, paving the way for the adoption of the anti-racism law. They include the 2016 cases of segregated busses in the country’s south which carried white and black school children and the stabbing of three Congolese students in a Tunis train station on Christmas Eve. This August, several young Tunisian men threw stones at a pregnant Ivorian woman near her home in the capital. Her husband and another Ivorian man intervened, and were injured in an ensuing fight. While these events sparked a national debate, activists said none of them resulted in prosecutions, with authorities citing a lack of laws or a lack of witnesses. There is only one black member of parliament – Jamila Debbech Ksiksi, while the country saw its first black news anchor only in May. The absence of black people in public life has led black children to think of their skin colour as an obstacle, said Zied Rouin, another member of Mnemty. “If you ask black children here if they like their skin colour they will say ‘No’,” said Rouin. The pervasive racism in Tunisia has begun to affect the country’s image and credibility abroad, said Mack Arthur Deongane Yopasho, a black student leader. The North African country has long been a popular destination for medical and engineering students from Sub-Saharan Africa. However, in recent years, the number of Sub-Saharan students dropped by the thousands, from 12,000 in 2010 to 5,000 in 2018. While some attribute the drop to the political turmoil in the country following the revolution that ousted long time President Zine El Abidine Ben Ali in 2011, Deongane Yopasho believes racism also played a factor. In addition to verbal and physical abuse, Sub-Saharan African students face institutional racism, which includes delays in obtaining visas and difficulties in accessing health care and jobs. “It is in Tunisia’s interests to host [foreign] students,’ Deongane Yopasho said. And if the country hopes to attract 20,000 Sub-Saharan African students by 2020, as stated by its government, it must apply the new law,” he said. Hamza Ben Achour, a black Tunisian music artist, said the new law was just the beginning in the fight against racism. “The law will not change anything. We need a cultural revolution,” he said. In 2015, his rap song “Kahlouch”, which explored how black Tunisians were treated as second-class citizens, sparked uproar, with many Tunisians denying the existence of any societal prejudice. He was accused of “inciting civil strife; of being sick; of being selfish”, he said. Binous, the flight attendant agreed with Ben Achour. She said while the new law would help her if she were to face racial abuse from passengers, much more needs to be done to dismantle and discredit racist beliefs. “My sister was playing on the street the other day. An adult man turned to her and said: ‘If God loved you, he wouldn’t have created you black’. She was 10-years-old,” she said.